This Friday we visited my favorite fresh (and imported) fish store. And while I was waiting for the ordered fish I suddenly remembered that I long wanted to make a salad of octopus. There were no fresh ones in the store – the “season” was only about to begin, but imported frozen ones were available. The one I ended up buying weighted about 4 kg (8.8 pounds) and looked quite fearsome – I would not want to face this beast alive 🙂 It ended up being a good thing that we bought a frozen octopus meat, since the flesh of grown-up octopus can be a bit harsh and will require softening (or freezing) before cooking anyway. 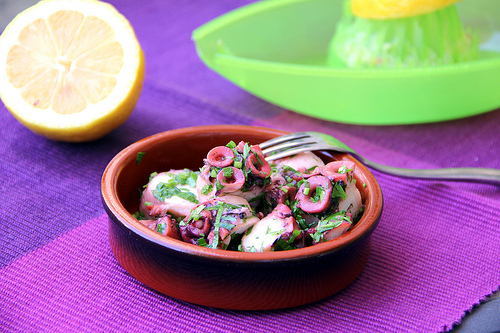 In case of baby-octopus, you don’t need to cut them at all, they are usually used in salads in whole. While the shop owner was cutting the octopus into 4 equal portions (the original was too big to fit in the regular home freezer as a whole) some people started asking me how to prepare it. Below you can find a very simple and tasty way of cooking octopus. Put the octopus into a cooking pot, cover with a lid and start cooking. Do not add any water. Within a very short time you will see that the octopus’ natural liquids get extracted and start the boiling/cooking process. Reduce the heat, add the pepper and the bay leaf and cook until tender. In our case, it took almost half an our of cooking to bring it to the desired condition, thanks to the fact that the meat was frozen. Fresh octopus would require significantly longer time, whereas baby octopus would require less. Try probing it with a knife – the flesh should be soft. 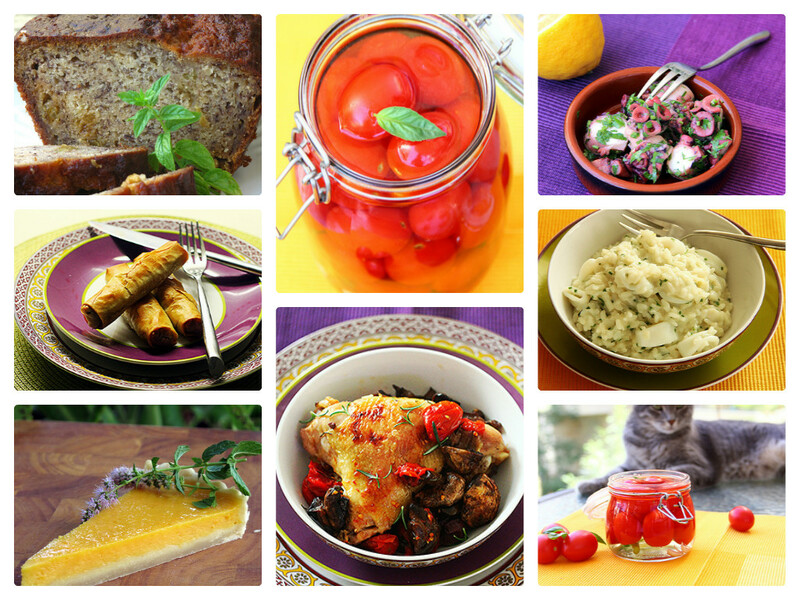 Cool and drain the juice – it can be frozen and used as a basis for soup or sauce for pasta dishes. Now you need to peel the skin. There is no need to go crazy about it, the main goal is to remove the coarse large pieces near the basis of the tentacles. Cut into rings, approximately 1.5 cms (1/2 inch) wide. Peel the leaves from the parsley branches chop finely. 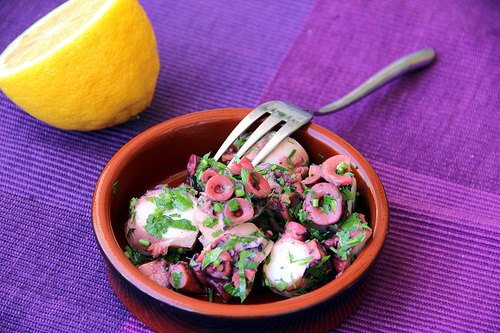 Mix the parsley with lemon juice, vinegar and oil, and pour the resulting sauce over the octopus. Leave the resulting dish approximately half an hour to soak the taste and become uniform. Adding salt is not necessary – it is already quite salty. Although a matter of personal taste, but we eat it as it comes out of the refrigerator, below room temperature.